Updated Thursday September 1, 2016 by Erich Weiler. Baseball Glove: One of the most basic items, your player will need a baseball glove, and it is the responsibility of the player to get one.There are many to choose from of course, but usually the best ones to start with are the ones the player can easily open and close. Some of the higher end gloves cost more and require a long break-in period (and they are extremely stiff during that period), making them not ideal for new players. It's recommended that your player try a bunch of them out at the store and pick one that is comfortable, not too big or too small, and that they can open and close with relative ease. Baseball Hat: It's always recommended to have a baseball hat on during practice, and is required during games. The League will provide all players with a baseball hat that matches their team. This hat is theirs to keep after the season is over. Hats are important because they block the sun, and glare, making catching the ball safer and much easier. Athletic Cup: Wearing a cup is strongly recommended for all players playing any position, and is required for all players playing the catcher position. It is the responsibility of the player to purchase one. There are so called "sliding shorts" available that players can buy that have a slot in the front of them that is specifically made for putting in an athletic cup. Baseball Bat: It is the responsibilty of the player to purchase a baseball bat. Often times they can borrow one if they don't have their own, but it is very strongly recommended that every player have their own bat. There are many types of bats available, and a little thought should be put into buying a bat for your player. Some bats are specifically not allowed for play by Little League International. The bat must be rated for a BPF of 1.15 or less (Bat Performance Factor) and the bat must be 2 1/4" in diameter. The bat can be made of any wood, but most kids use non-wood bats such as aluminum bats or composite bats because they are lighter and faster. Special care should be taken when purchasing a composite bat, as they are more expensive and must be specifically approved for play by Little League International. The Little League Bat Rules are located HERE. We also have an Article on Bat Selection that is very useful for determining what kind fo bat is a good fit for your child in terms of weight, length, material, etc. Bats cannot be bent, have dings in them, or any visible damage. Such bats will be disallowed from play for safety reasons by the umpires during bat inspection prior to each game. Batting Helmet: It is recommended that your child have a batting helmet, as every player is required to wear one whenever they are batting. They are relatively inexpensive and widely available. Many teams have a couple extra on hand, but if possible each player should have their own. Batting Gloves: Batting gloves are 100% optional, and only needed if the player prefers to have them. They are good at reducing sting when swinging a bat. Cleats: Cleats, or baseball shoes, are required during games, and are the responsibilty of the player to obtain. They are special in that they have rubber (usually) "spikes" or "bumps" on them that help in running and prevent slipping when rounding the bases. Baseball Pants: Baseball pants are the responsibilty of the player to purchase, but before purchasing baseball pants, consult with your team's manager to see what color or style of baseball pants your team will be needing that year. All players on a given team will need to have matching baseball pants (in color). Baseball pants are recommended during practices and required during games. Jerseys: A jersey for your child's team will be provided by the league just prior to the regular season starting. For Tee Ball, Farm and AA, the player may keep the jersey after the season is over. For AAA and Majors, the players must return their jersey to the league at the close of the season, as those jerseys are of a higher quality material and are used for several years in a row before being retired. Belt and Socks: It is the player's responsibility to purchase a baseball belt and tube socks. Consult with your team's manager to find out what color socks and belt to purchase, as that color will change with each team. Catcher's Gear: Catchers gear will be provided by the league for each catcher, although players that like playing catcher are allowed to have their own catcher's gear if they like, as long as it is in good shape and not damaged. Catcher's Gear is inspected by the umpire for safety prior to each game. Catcher's gear includes a catcher's helmet/guard, a chest protector, a catcher's glove, a throat protector for the helmet and knee/shin guards for both legs. Note that there are no catchers behind the plate in Tee Ball. Baseballs: The league will provide baseballs for practice and games. 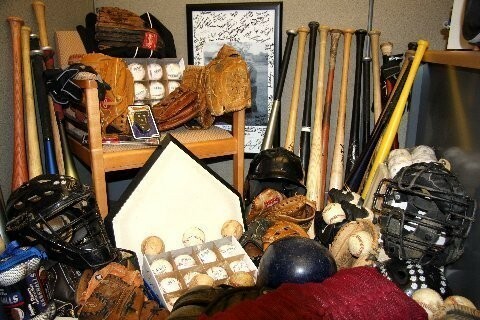 Although many players like to have a few baseballs of their own so they can play catch and practice at home. Also remember, and this is very important, that you label any gear that is the property of your player with their name! Gear gets lost all the time, and most of the time if the lost item has the player's name on it, then it will be recovered. Theft is not usually a concern, but simply losing items happens all the time. Labeling your equipment is key to prevent things getting lost.